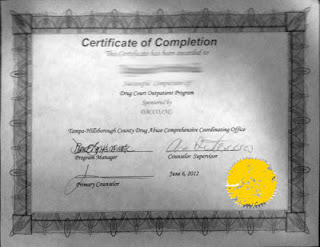 Drug Court - Hillsborough County, Florida - Happiest day I have ever had in years in the Hillsborough County Drug Court. Today someone who I thought was lost, to IV drug use (oxycodone etc. ), completed the Drug Court Program and serious Felony Drug Charges were dropped. Special Thanks to Rich Uhlman, Rita Mitchell and Circuit Judge Jack Espinosa for being so patient with this guy. He went to jail several times, went through several programs, completed residential treatment, and is still alive. Congratulations to the big winner of our most courageous recovery of the year award.